At Prep-Rite Painting, we are your preferred commercial painters when you want your office environment to look professional and put together. 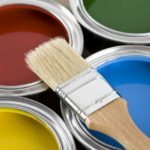 With our more than two decades of experience painting homes and offices in the Raleigh, North Carolina area, there is no better place to turn than to our team when you want a fast, efficient, and accurate commercial painting job done at your place of business. We’re passionate about what we do, and it shows in the way we treat our customers and the thoroughness of our work. Contact us today to find out more!